If you have ever hosted Thanksgiving for family or friends, then you know how easily the costs can spiral out of control. The turkey, the pies and the casseroles can add up to an expensive grocery bill. You want to have a memorable Thanksgiving, but you don’t want the bill to be outrageous. In order to save some money on your Thanksgiving Day meal, you need to be a creative cook. 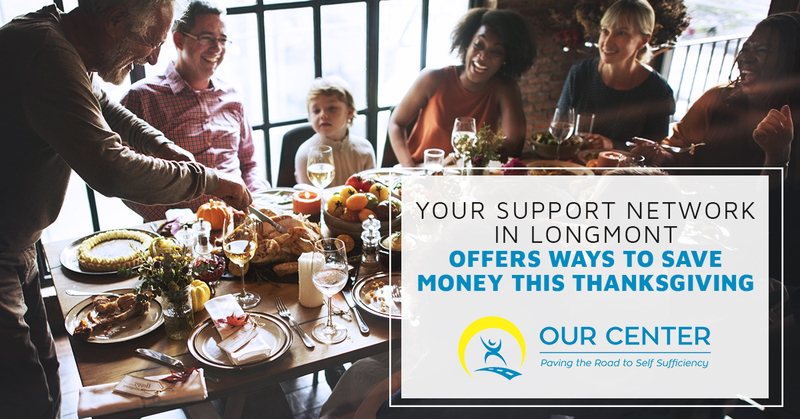 Our Center, your support network on Longmont, offers tips to save money this Thanksgiving. If you are hosting Thanksgiving and having family or friend over for the occasion, there is no shame in having them bring a dish for everyone to enjoy. In our opinion, it is unfair to leave the responsibility of paying for and cooking a huge meal for a big group of people. Ease the burden by telling people to bring the goods. There is no law that states you have to have a traditional Thanksgiving Day meal consisting of turkey, mashed potatoes and yams. There are families who choose to make different ethnic dishes for the holiday. You can serve Mexican food, Asian food, really, anything you want. It is a great way to save money because rice, beans and vegetables are a lot cheaper than a huge turkey. They are a lot healthier as well. Also, think about what dishes you have made in the past that never go over as well as you think. There is no use in buying the ingredients and cooking up a potato casserole that you wind up tossing most of it anyway. You don’t need to buy fall-themed decorations when nature provides everything you need for free. Take a nature walk with a bag and collect pine cones, a few leaves and a small branch or two from an evergreen tree. Your Thanksgiving Day meal is usually followed by a week’s worth of leftovers. Part of this reason is that you cook for 12 when only 10 people are showing up. Get a solid head count of who will be there and only cook enough food for that amount. Also, think about portions. Your average guest won’t eat a pound of mashed potatoes, so do a little homework to determine portions per person. Keep an eye out for local deals and coupons, these are great ways to save you a lot of money. Local newspapers update sales at grocery stores and offer grocery store flyers in every Wednesday edition of the newspaper. There are also apps you can get that will help you find the best deals. Don’t just go to the store and wing it. You need to make a comprehensive list of the items you will need and how much. And make sure you stick to that list when you get to the store. The best thing you can do for yourself when you feel winter taking its toll on your mental well-being is to reach out for help. Feel free to come talk to us at OUR Center.